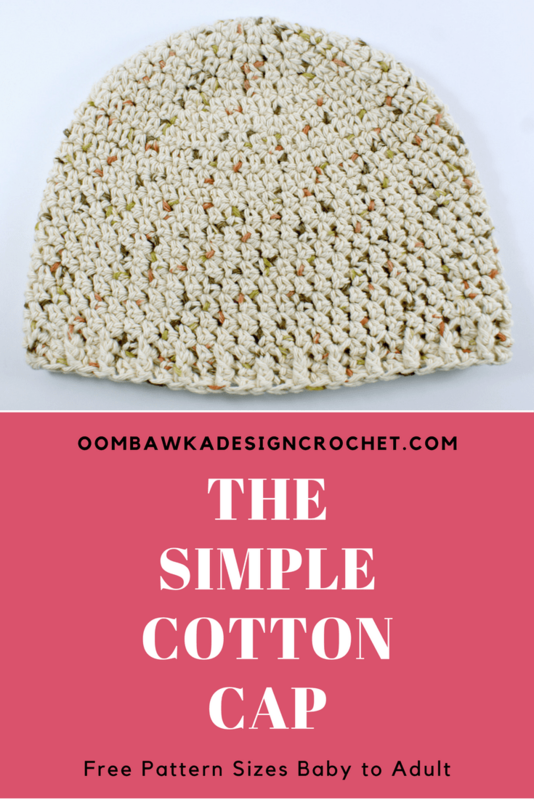 The Simple Cotton Cap Pattern is a crocheted beanie you can make with medium weight cotton yarn. 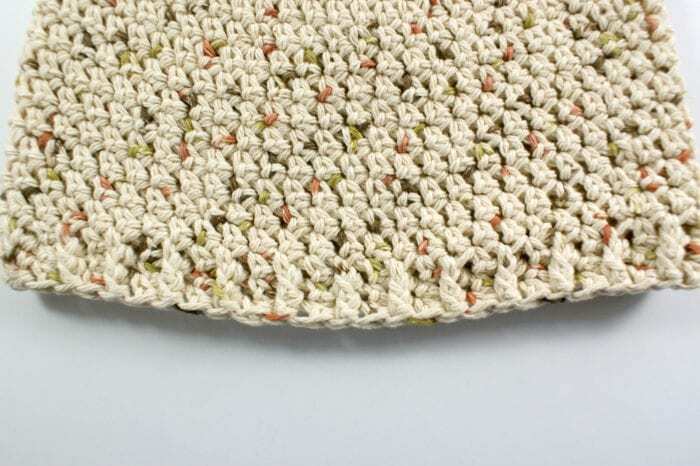 The yarn I used is Bernat Handicrafter Cotton but you can easily substitute Lily Sugar ‘n Cream Yarn or Red Heart Creme de la Creme yarn. 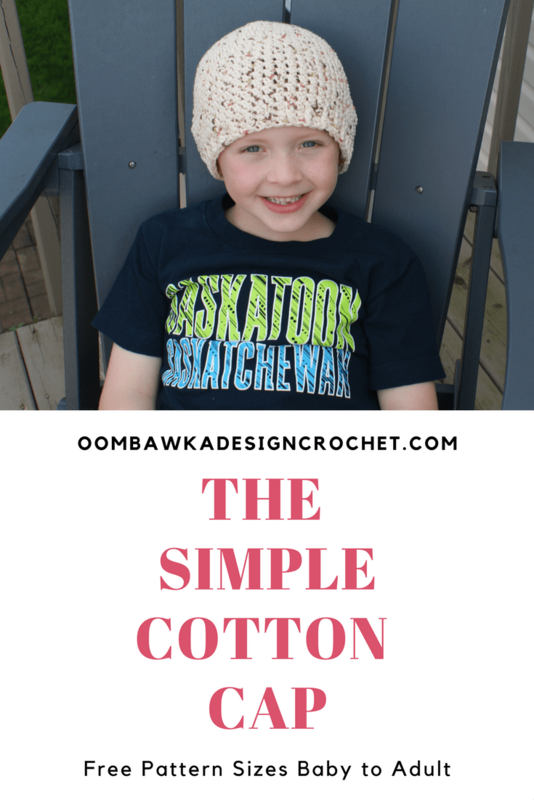 The written pattern instructions include options for two different beanie lengths. The mid-ear length beanie would be suitable for daily wear. The base-of-earlobe length is designed to provide coverage to the neckline for chemotherapy patients. If you would like a different overall length you can simply add, or remove repeat rounds in your specific sized hat to get the desired hat height. Approximately 3 esc per inch and 3.2 rounds of esc per inch. Two lengths have been provided. The pattern is written to fit to the base of the earlobe with a note at the end of each size to help you size this to reach mid-ear length. If you would like to create a slouch hat design you simply repeat the repeat rounds more times until you reach the length you want. Finished hat size: 11″ circumference, 4.5″ height. To fit 12″ head size. If you would prefer the hat to reach mid ear, stop your repeats after R8 and then proceed to R11 and follow the remaining instructions to complete the hat. Finished hat size: 13″ circumference, 5″ height. To fit 14″ head size. If you would prefer the hat to reach mid ear, stop your repeats after R10 and then proceed to R13 and follow the remaining instructions to complete the hat. Finished hat size: 14″ circumference, 6″ height. To fit 16″ head size. If you would prefer the hat to reach mid ear, stop your repeats after R13 and then proceed to R16 and follow the remaining instructions to complete the hat. Finished hat size: 16″ circumference, 6.25″ height. To fit 17″ head size. If you would prefer the hat to reach mid ear, stop your repeats after R14 and then proceed to R17 and follow the remaining instructions to complete the hat. Finished hat size: 17″ circumference, 6.75″ height. To fit 18″ head size. If you would prefer the hat to reach mid ear, stop your repeats after R14 and then proceed to R18 and follow the remaining instructions to complete the hat. Finished hat size: 18″ circumference, 7″ height. To fit 19″ head size. If you would prefer the hat to reach mid ear, stop your repeats after R16 and then proceed to R19 and follow the remaining instructions to complete the hat. Finished hat size: 19″ circumference, 7.5 ” height. To fit 20″ head size. If you would prefer the hat to reach mid ear, stop your repeats after R17 and then proceed to R21 and follow the remaining instructions to complete the hat. Finished hat size: 20″ circumference, 8 ” height. To fit 21″ head size. If you would prefer the hat to reach mid ear, stop your repeats after R18 and then proceed to R22 and follow the remaining instructions to complete the hat. Finished hat size: 21″ circumference, 8.25 ” height. To fit 22″ head size. If you would prefer the hat to reach mid ear, stop your repeats after R19 and then proceed to R23 and follow the remaining instructions to complete the hat. Finished hat size: 22″ circumference, 8.75 ” height. To fit 23″ head size. If you would prefer the hat to reach mid ear, stop your repeats after R20 and then proceed to R25 and follow the remaining instructions to complete the hat. Finished hat size: 22″ circumference, 9″ height. To fit 24″ head size. If you would prefer the hat to reach mid ear, stop your repeats after R21 and then proceed to R26 and follow the remaining instructions to complete the hat. How do you do a esc in the MR?